The Skype app, which is available as a free download in Windows 10, enables you to send IMs to friends, as well as to make voice and video calls. To make a call to a contact, you have to connect a microphone and speakers to the system. Or, you can use a headset/microphone combination that’s designed for making online calls. Follow the instructions that came with your computer and the devices for connecting and setting them up in Windows. In the main Skype screen, click Contacts in the left pane, then the contact to call in the Contacts list. Click the Call button (see the following figure) to the right of the contact’s name. If a box with choices pops up, click Call Skype. (Charges apply if you click Call Mobile.) 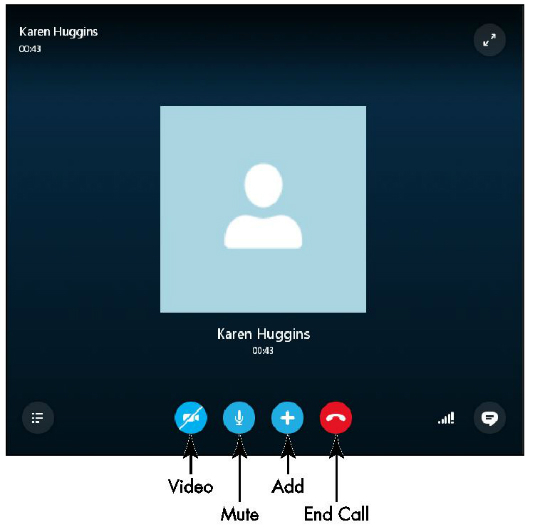 Your contact will see a pop-up box in Skype where he or she can click to accept or hang up the call. Talk as you normally would using the microphone. Move your mouse over the contact to display buttons for working with the call. You can click the microphone button (see the following figure) to mute and unmute your microphone. The button with the plus on it lets you add more contacts to the call, among other things. Click the End Call button at the right below the contact photo to finish the Skype call. Click Home in the left pane to go back to the main Skype screen. If you’re finished using Skype, click the Close button. To dial a phone number with Skype, click the Call Phones button (with the phone icon) on the main Skype screen. Use the onscreen keypad to enter the number, including the area code, and click the round Call button at the bottom. Note that calling fees apply. In the United States, you can pay per minute as you go, or buy a low-cost monthly subscription. If you simply close the Skype window, you are still signed in to Skype and will appear as Online (available for calls and messages) to your Skype contacts. If you receive any incoming IMs or calls, Skype will reopen to alert you. If you do not want to be available, you have two choices that you can make before closing the Skype window. You can either click the Skype menu and click Sign Out (in which case, you will have to sign back in when you restart Skype), or you can click the Skype menu, point to Online Status, and click a different status in the submenu.